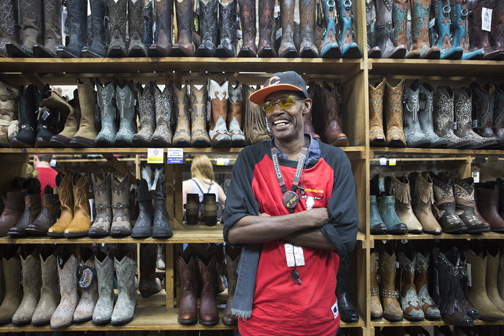 Jeffrey Lloyd, also known as the “Boot Doctor,” shares a laugh with customers at Boot Country. He says he’s had this unique talent ever since his youth as one of 11 children growing up in Chicago. He moved down to Nashville to be with his mother, Yvonne Lloyd, 90, who retired to be in her hometown. The people he meets are his reward for all the boot doctoring he’s done. “I grew up with a lot of siblings, and I like people,” he says, adding he really enjoys “dealing with people from far regions, any region you can imagine. Overseas….” from whom he’s learned a lot about humanity. One thing he’s noticed is that country music fans from England, in particular, “come here for cowboy boots, but they buy motorcycle boots.” God bless the Queen. The good doctor looks over at a new face in the store, Mike Malone, 44, from Jeffersonville, Indiana, who is here with his wife, Tessie, 43. “Take off your shoes, so I can look at your feet,” says the Boot Doctor, who looks closely at Mike’s stockinged-feet before disappearing into the maze of boots and customers. While he and Tessie wait, Mike explains that they are Philadelphia Eagles fans, primarily because of “Rocket” Randall Cunningham, one of the pioneering black NFL quarterbacks who spent 11 of his 16 pro years in Philly. Mike, an independent contractor, says he wears work boots, not cowboy boots, but explains “Tessie is trying to bring the cowboy out in me” by encouraging him to buy a pair. He is a country music fan of sorts. “I like the old stuff, Johnny Cash,” he says, shaking his head when asked about the bro-country movement. The Boot Doctor returns with a pair of squared-toe, beige-on-brown boots and tells Mike to put them on. “I’m just trying them for the fit,” says the Doc, again retreating into the rows of shelves to find a style that might fit this shopper. Meanwhile, Mike looks over at Tessie.